The snowy owl, in happier times on Jan. 24, resting on a ledge in Washington, D.C.
A snowy owl that ventured south to the unlikely habitat of Washington, D.C., was clearly not cut out for city life. The animal was hit by a bus and was recovering with wildlife experts Friday. 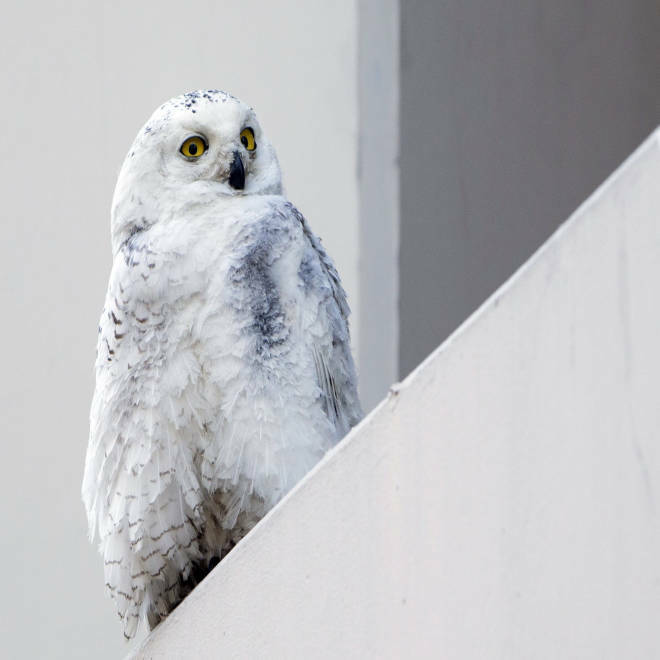 The female snowy owl, a species usually found in the Arctic tundra, has become something of a local celebrity in the city. Police found the wounded creature after it was hit by a bus in the area of 15th and I streets on Thursday, NBC News Washington reported. It was being treated at the Smithsonian’s National Zoo on Thursday night for a bloody beak and a broken foot, but there were no signs that it had sustained a serious head trauma. Snowy owls are generally found in areas such as the Arctic, Canada, Alaska and northern Eurasia. But the birds sometimes find their ways as far south as Texas and Georgia. The owl's celebrity status in D.C. has been boosted by its very own Twitter account, @DCSnowyOwl. The bird currently has more than 700 followers and has been tweeting throughout the real owl’s ordeal. It has been a tough day. This #Snowy is sleepy and needs healing rest. Give a shout out to a higher power that I make it through the night. In a video posted online by the zoo, the animal looked dazed and subdued as it was handled by staff, a far cry from the majestic creature which has been seen swooping over parts of the district of late. But the zoo said the owl should make a full recovery and it will be released into the wild once as soon as it does. Several parks in Appalachia and along the Eastern Shore have already offered the bird a new home, NBC News Washington said. Cold-loving snowy owls migrate from Arctic to ... Boston? !